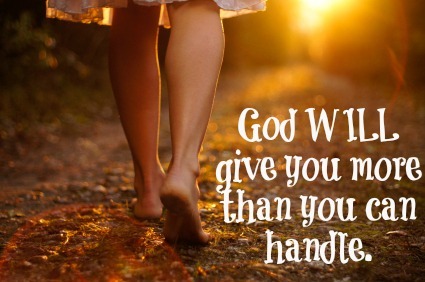 I’m guessing that most of us have heard the saying, “God won’t give you more than you can handle.” You’ve heard it right? I know I have. I know I’ve said it. Guess what? I think it’s a big fat lie. I think the opposite is true. I think that God very intentionally gives us more than we can handle. He’s been doing it to me quite a bit lately. I’m still not clear on what is the source of my doctor’s concern with my testing. I’ve had the ultrasounds, the blood work, the biopsy, and MRI and I am still waiting for the outcome. It’s shaken me more than I’ve ever imagined. I’ve worried, not worried, cried, big girled up and cried some more. A four year with relationship with a young woman I’ve mentored has ended. Abruptly. I’ve cried over that too. I’ve been angry, hurt, disappointed and scared over this too. I’ve had money stolen from my wallet recently. Not tons…but it was money purposed for something important. And it’s lost. No one claims the action and that leaves me feeling poorly,taken advantage of — generally used. My mentoring organization… I’m not feeling very connected, I’m not feeling included, appreciated and valued. At all. I’ve been feeling that unless I am a squeaky wheel… well, then no news is good news sort of thing. Not good. There’s some family dynamics that are so utterly big, the possibility to be horribly disruptive and destructive and it’s shaken me literally to my core. I’ve been rattled to the place where the hurt of the heart is real and physically present. I’ve been mad, angry, disappointed, shattered, hurt… and more than anything scared. The point, is that God does give me more than I can handle, it’s intentional. It’s intentional because he is simply there waiting for me to call out to Him. To take that which I can’t handle alone and help me work through each and every step to some larger purpose. The outcomes of most of these things… save the theft are still so very up in the air. I’m being called to pray, consider, and wait. The waiting is the hardest part. Having faith that God has my back is hard, even though I know it’s true. God gives you more than you can handle, so you’ll pick up the spiritual phone and call out to the ONE who can move mountains. This entry was posted in Life and tagged Adversity, Christian, Faith, God, Hope. Bookmark the permalink. I don’t know why, but it’s seems when something goes wrong in life about a thousand other things follow and blow up as well. I feel it’s a test of faith and definitely a test of strength. Because anyone who has struggled goes knows that better days always lie ahead. You just have to remind yourself that nothing lasts forever and treat your situations as opportunities to become a stronger man/woman than you once were. So so true. It’s gone from one thing to what seems like a million others. I’m sure there are better days ahead, though navigating these days, today… it’s tough. But, I am 100% there is nothing that is too much for God.